How can leaders inspire & motivate when sharing goals? 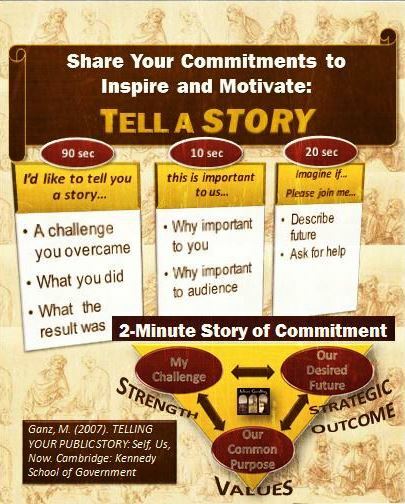 By making each goal a 3-part commitment and sharing it as a 2-minute story. It takes more than telling others what your goals are. It is about being intentional about the way you share your commitment and how you connect to others as you do so. If you share your commitment as a story, then you are more likely to inspire and motivate others. Shared values connect us to each other. Stories inspire. So, once you have built your 3-part commitment, construct a 2-minute narrative that tells the story of your challenge, what is important, and the desired future. How is ‘sharing your vision with others’ working for you? What would happen if you shared your goals as an “imagine if…” story? What are the consequences of others not knowing what you are committed to? Denning, S. (2007). The Secret Language of Leadership: How Leaders Inspire Action Through Narrative. San Francisco: Jossey-Bass. This entry was posted in Leadership, Networking and tagged Commitment, Goals, leaders public story, leadership. Bookmark the permalink.